Splitgate is a competitive first-person shooter set in a series of near-future arenas. Movement and gunplay should be instantly familiar to anyone who’s played a Halo game. Many of the guns can be directly traced back to Halo, such as the classic scoped pistol. More powerful guns are scattered throughout the maps, for a total of nine different weapons. No place is truly safe, leaving the gameplay fast-paced and the average life expectancy quite low. Splitgate sets itself apart from other shooters by introducing portals. Everyone starts with a portal gun on their wrist, which can be used to make a a pair of portals with the press of a button, exactly like in the Portal puzzle games. Portals can only be created on certain clear blue sections of walls, floors, and ceilings, but these areas are liberally scattered throughout each arena. The colorful maps are designed like future-sports arenas. Arenas are made up of a series of suspended platforms and hallways that reward clever portal placement. Some areas, like an elevated sniper’s perch that spawns a sniper rifle, can only be reached via portal. Like in the Portal games, you maintain your inertia when exiting a portal. Fall into one portal and you come soaring out of another. When combined with the innate jet pack, moving around the arena is exhilarating, and should make for a highly frenetic spectator sport. On the surface Splitgate plays very similarly to many other Halo-like shooters. But I quickly discovered how much the portals change the dynamic. Portals can and should be used to not only reach certain areas, like that sniper perch, but also to flank enemies. Players can use each other’s portals but can’t see through them, creating some interesting situations. Portals will flash when enemies are directly on the other side, alerting you to fire into the portal. If you’re quick you can even create a hilarious portal death-trap by dropping a portal under their feet, with a second portal over the void. 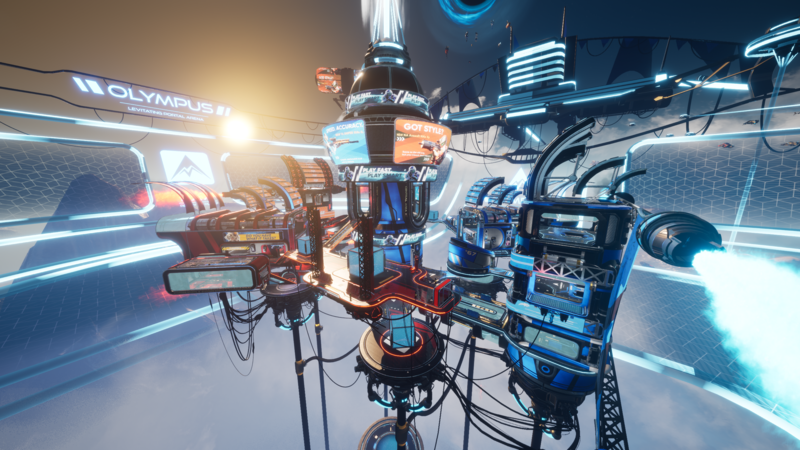 Currently in closed alpha, Splitgate has four well-designed maps, with another four on the way. Matches support up to 10 players, with eight being the magic number, according to Proulx. I only tested the standard free for all deathmatch with offline bots, but the final game will boast other common game play modes such as team deathmatch, king of the hill, and Halo’s popular Team SWAT mode. Splitgate doesn’t have a standard progression system. But it will have unlockable skins for different armor pieces, guns, jet packs, and portal guns through random rewards. “It’s the Overwatch model mixed with the old Call of Duty model,” says Proulx. “We do think it’s important to have that progression, and that you can earn everything through gameplay.” Some of the skins are random rewards, while others are tied to certain achievements. “This game is pretty rock solid as is. We could be in early access right now if we wanted to be,” says Proulx. “But philosophically, we wanted to make a game like the old days – you buy it, it works, and it’s a finished product. And for a competitive game, what we envision as an esport, it’s not acceptable to have bugs that can affect competitive play.” The developer is planning on further scheduled alpha tests with an open beta leading up to launch. The release date has not yet been announced beyond an estimated Q2 2019. Currently Splitgate is only launching on PC, but Proulx confirms they hope to launch on consoles as well. Splitgate: Arena Warfare’s old school arena shooter multiplayer feels somewhat archaic, but that’s also kind of the point. Moving and shooting is very fluid and responsive. The portals are easy to use and a great way of weaponizing what was formally a puzzle-focused game mechanic. Splitgate has a high skill ceiling but could be very rewarding for skilled, competitive shooter fans who are feeling left behind in the Fortnite-dominated age of Battle Royale.